St. William’s on Long Point in Raquette Lake offers FREE Thursday events during the months of July and August there. Lisa Meissner of the acoustic group, Rustic Riders. Lisa and her husband Klauss will be performing at St. Williams on Long Point in Raquette Lake on August 23, 7:00 p.m. There will be two other special events as part of the St. William’s on Long Point Thursday series, though the August 30 and October 6 events will be held at the Raquette Lake School on Route 28. In 1889 William West Durant established the town of Durant on a peninsula that was water-accessible only. 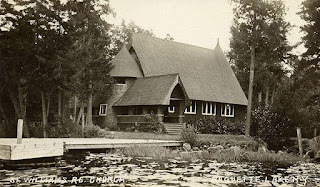 Located on the southeastern part of Raquette Lake, W.W. Durant’s town soon included a general store and post office. Originally a Catholic Church, St. William’s was completed in 1890. The town of Durant changed its name to Raquette Lake and relocated to its present site due to its more convenient location to the railroad coming from New York City. 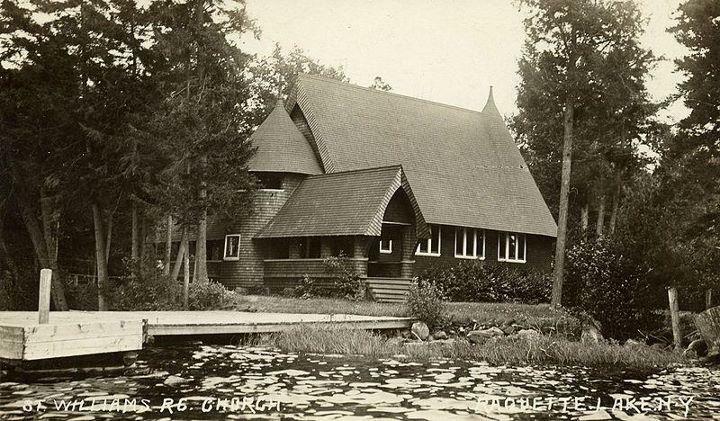 In the late 1930s the rectory in Raquette Lake burned and the new St. William’s was built in town. St William’s on Long Point began offering mass mostly during the summer season. St. William’s evolved from a functioning church to summer retreat center for Franciscan Friars to its final not-for-profit, nondenominational status in 1993. A year later, events were introduced to bring public awareness to the historic site through the free Thursday evening programs. On the National Register of Historic Places, St. William’s currently accommodates overnight guests for weddings, groups or retreats in its water-access only property. As with all the St. Williams Thursday events, this one is free and open to the public. Reservations are required for the boat transportation, which leaves from the Raquette Lake town dock. The boat leaves at 6:00 pm and returns at 8:30 pm. In cases of severe weather, events are relocated to the Raquette Lake School. Call 315-354-4265. I hope to see you there. © Diane Chase, author of the Adirondack Family Activities™ guidebook series, Adirondack Family Time™. Adirondack Family Time: Tri-Lakes and High Peaks (Your Four-Season Guide to Over 300 Activities) for the towns of Lake Placid, Saranac Lake, Jay/Upper Jay, Wilmington, Keene/Keene Valley which is available online or bookstores/museums/sporting good stores or Adirondack Family Time: Champlain Valley: Plattsburgh to Ticonderoga. Diane is currently working on her third guidebook of the series.